The 3rd Endoscopic Paranasal & Skull Base Surgery Workshop was successfully held at HYGEIA Hospital on January 14, 2017. The event commenced with the live broadcast of a complex endoscopic paranasal procedure, screened to a packed auditorium. The procedure was performed by the Director of the Endoscopic Paranasal & Skull Base Surgery Department, Dr Christos Georgalas, who also took questions from the audience and explained all the surgical steps. The Workshop was divided into two parts. The first part was dedicated to Rhinology, ranging from basic paranasal anatomy to the role of imaging in endoscopic surgery and its complications. The second part was dedicated to endoscopic skull base surgery, a new and developing field that brings together rhinologists and neurosurgeons. 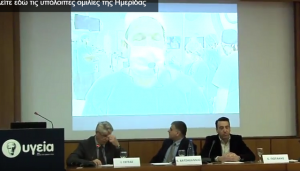 This partnership was also evident among the attendees and the speakers, who included the Director of the HYGEIA Hospital Neurosurgery Department, Dr Panos Nomikos. Dr Isam Alobid, one of the invited guests, made quite an impression due to his deep knowledge of endoscopic paranasal surgery, as well as his extensive experience on the closure of large skull base defects. The event was concluded with presentations of interesting cases and talks by speakers from some of the largest public hospital in Athens.